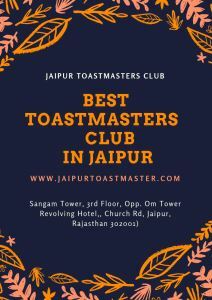 jaipur toastmasters club have made their impact in Toastmasters community as best toastmasters club in Jaipur with serving leadership qualities among the toastmasters to help them grow in their personal and professional rathers JTC provide a quality where all their members can become a better version of them self. Well said by Confucious – If you think in terms of a year, plant a seed; if in terms of ten years, plant trees; if in terms of 100 years, teach the people. A similar feeling we too derive out of it while planning to celebrate our 100th meeting of Jaipur Toastmasters Club. The seed the club has grown up with several leadership branches & wings by creating and nurturing next-gen communicators and leaders. We have well served our motto by serving, excelling and impacting lives that have helped all of us to become better versions of ourselves. This gives us immense pleasure to announce that we are going to celebrate it in all unconventional ways full of fun and party. Your presence is going to add an extra edge to the fun. Hence, we formally invite you all to be a part of a celebration of achieving 100th meeting milestone. Let’s join us this Saturday from 5:30 PM onwards to celebrate, sing and dance together.